My shiba Kota is 10 months old and is obviously still a puppy. I love him to death, but man is he super bitey / nippy/ barky. It has gotten ten times worst within the last couple months. Like he's going through his "terrible twos." I will be laying on the couch minding my own business and he will come up and nip at my arm. I'll tell him no and he will continually do it like he's playing. I've tried putting him on the ground in a submissive position and tell him no. Tons of time outs (when I finally end up catching him from running away knowing he is going in time out) where he will not have it and bark and cry continually in time out. And I just tried a spray bottle for biting and barking but he just loved it and didn't care. -___- Any one have any good tips for this kind of behavior? 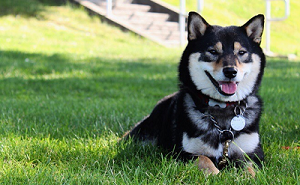 Also just with me and not my boyfriend he will bare his teeth and growl ferociously at other dogs--even at another female shiba that is in our neighborhood that I was so excited for him to meet! *sigh* Any tips for that? Again, I know he is just a puppy but just wanted to know if this has happened to any of you and any tips that helped so I can help Kota :) thanks guys! No worries, you've come to the right place. My guess is your lil guy is just bored. Have you been sticking to the same routine/schedule? He probably needs more play time, and not just an outdoor romp, but something interactive like fetch. I stumbled upon this site, http://www.doggiebuddy.com/topics/Trainingtopics/traintopic3.html and think maybe there are a few your guy would have fun learning. I can't help with the dog on dog anger, my dog doesn't try to protect me. I haven't searched for myself, but I'm sure there are a bunch of threads about this problem (I've seen it come up before). Have you read those yet? I agree with the boredom thing. Bored puppies will do just about anything to entertain themselves. I wouldn't use "Cesar Milan" style training on any dog for a couple reasons. 1. I think he goes overboard with the premise of "pack mentality". 2. I have only ever seen bad come from his methods with Shibas (the blogger at shibashake.com tried repeatedly and posted about the issues with this style). So, first, I'd stop trying to dominate your dog. It's just going to hurt your relationship with him and it's obviously not working anyway. A routine is super useful for teaching him when play is acceptable and when it's time to relax and be calm. The baring his teeth and growling thing might be him being protective of you. Kiri (my Shiba) is more alert and careful if we're alone vs with a male. Have you socialized him? Many humane societies/pet stores have a free socialization hour once or so a week for dogs under a year. I've tried putting him on the ground in a submissive position and tell him no. he will bare his teeth and growl ferociously at other dogs--even at another female shiba that is in our neighborhood that I was so excited for him to meet! *sigh* Any tips for that? Um... Have you gone through puppy classes? Socializing? Any positive experiences with other dogs? Also, not all Shibas get along with every Shiba, either. :P Sagan has a love/hate relationship with new Shibas he meets. Thanks for all the comments. The whole putting him in a submissive position has only been going on for a week since my friend who works with dog trainers and groomers told me to do so. So I will stop doing that.